rocky's bru: So what's the story, TRP? Back then they told me Omar Ong was the man behind The Rakyat Post. Well, I remember thinking, why not? He was close to the PM and while he might not have the deepest pockets, financing a portal shouldn't be too taxing. And TRP seemed to be doing so well: its editorial team consisting mainly of experienced ex-mainstream journalists and editors were proving that a news portal could still remain faithful to journalism ethics and build up traffic without having to be rabidly and morbidly anti-government (or pro-Opposition). But late last year there were talks that TRP was having some funding problems. RM1 million a month was proving too much, especially given the pathetic ad revenues. And then all of a sudden, they announced that The Rakyat Post was shutting down operations. 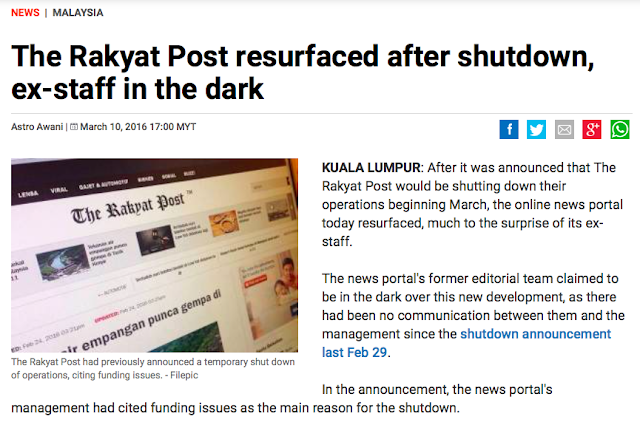 Some 70 journalists and editors were thrown into the streets, not paid a single sen since the New Year, and on Feb 29 The Rakyat Post announced that it was ceasing operations. Understandably, the 70-odd journalists who became jobless after the Feb 29 "shutdown" are feeling they have been conned. "The management has not responded to communication since the shutdown. They haven't paid us our Jan and Feb salaries." Many of the ex-TRP journalists are my friends and former colleagues. All have bills to pay, mouths to feed. They have filed complaints with the Labour Office, the Industrial Court and the EPF. p.s. I hear The Malaysian Insider has new paymasters? Feel sorry for the journos, of course. Hope for the best only. And whether "online" still exists in 2 years with the Bugis lanun & Syed Keropok trying to stem the mighty flood of the information age with their bare fingers - well, wait and see. "The management has not responded to communication since the shutdown. They haven't paid us our Jan and Feb salaries." If you know a business venture is in trouble, give your people full disclosure. Let them make alternative plans. And never, ever shortchange folks and run away. It's just wrong. Two months missing pay is no joke, in the current economy. Yes it's curious that the Rakyat Post website is up to to date as of today, Friday 11th March 2016. Something is going on but what. and which ghost or ghosts are running the Rakyat Post website? TRP was an ill-conceived project and a sheer waste of resources. What's the ROI, if any or outcomes achieved? Nothing impressive. You cannot shape and influence opinions via such a tired old approach and unimaginative strategy. Rocky - between us, I'm sure we could have come out with a much better brew with the same multi-million ringgit budget.